The 2012 World Series of Poker has seen a number of achievements and accomplishments and we haven’t even gotten through the Main Event yet! But with the Big One for One Drop tournament, a woman winning an open-bracelet for the first time since 2008, the Ivey and Hellmuth show, and The Grinder pulling off an improbable feat it’s already been a WSOP for the ages. In this article I will recognize the five players who really stole the show during the preliminary events of the 2012 WSOP tournament series. Antonio will forever be known as the player who won the Big One for One Drop tournament, and the largest purse in poker history, pocketing over $18 million. 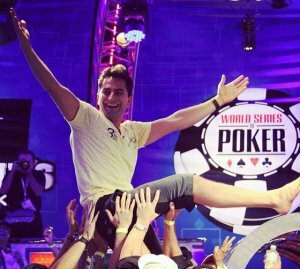 Antonio also cashed five other times at the 2012 WSOP, including a 3rd place finish in the $3k shootout, but this singular achievement, winning the One Drop tournament, was definitely enough to make Antonio one of the standouts of the 2012 WSOP. Selbst was the last female player to win an open-event at the World Series of Poker, which she did in 2008, and this year she ended the drought for the ladies by capturing her second career WSOP bracelet in the $2,500 10-Game Mix event. Vanessa also finished 4th in Event #2, a $1,500 NLHE tournament, and cashed a total of four times in 2012. The Poker Brat picked up his 12th career WSOP bracelet in 2012 –avenging his three runner-up finishes in 2011—and was seemingly in the mix at every tournament for a two week span. Hellmuth’s 2012 WSOP also included a 4th place finish in the Big One for One Drop, and a 4th place finish in the $10k HORSE event. In total Phil cashed six-times in the 2012 WSOP, and for the second straight year was a contender for the WSOP Player of the Year award. Phil Ivey basically dominated the WSOP over the course of a two week span that saw him reach a mind-boggling five final tables, and for the entirety of the 2012 WSOP Ivey cashed in seven different tournaments. Even though Phil couldn’t seal the deal and pickup bracelet #9, his feat will go down as one of the best runs in WSOP history, and has him in contention for the 2012 WSOP Player of the Year award. The Grinder is one of the streakiest tournament players I’ve ever seen, and 2012 was no exception as he made three final tables, and didn’t cash in any other tournaments. One of those final tables was in the $50k Poker Players Championship, which Mizrachi went on to win, becoming the first repeat winner of the extremely prestigious event, and doing so by winning the Poker Players Championship two out of three years.